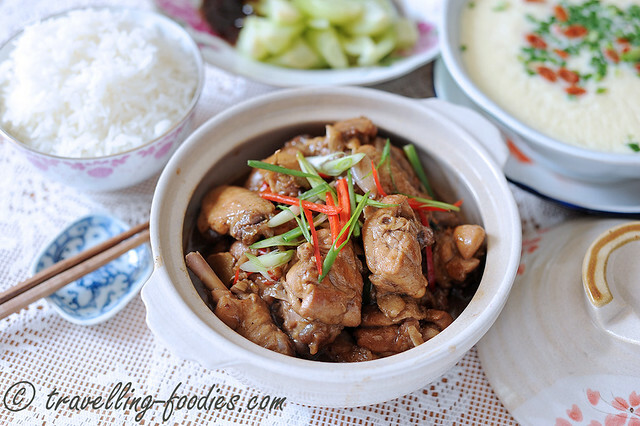 柱候酱焖鸡 Braised Chicken with Chu Hou Sauce is a traditional Cantonese dish devised from the use of Chu Hou sauce, a condiment which originated from Foshan in Guangdong China, much loved for its piquant flavours. While the braised beef brisket version is much-loved by many, the one cooked with chicken is no less delicious, very moreish especially with the sauce drizzled over a bowl of steaming hot rice. 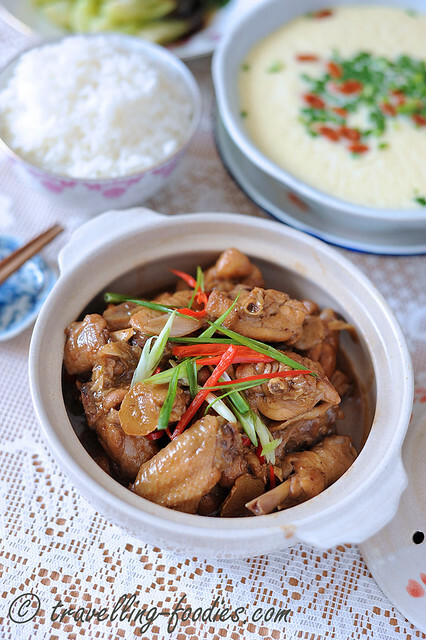 For the dish, small chickens which are no less than 1 kg in weight are used. This ensures that the meat remains uber tender and succulent, given the relatively shorter braising time, compared to beef. I typically work with cornish hens for this dish but drumsticks and chicken wings work wondrously as well. 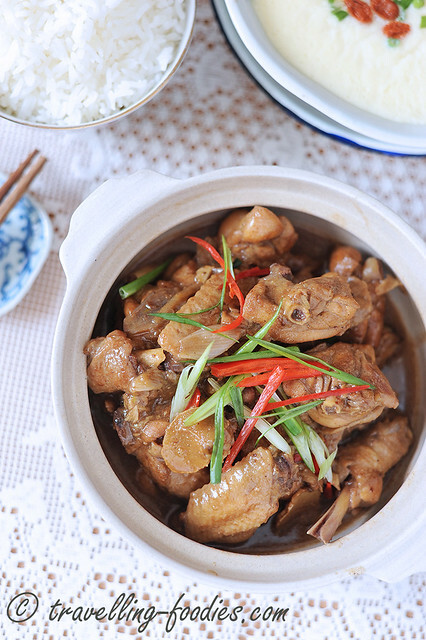 Traditionally, 柱候酱焖鸡 Braised Chicken with Chu Hou Sauce is cooked with whole chickens，which need to go through the wok filled with heated cooking oil first before being braised. This is a technique known as 泡油 in traditional Chinese cooking. But for the home kitchen, the process can be simplified, using a chicken which is chopped up into smaller pieces which are then marinated prior to a short braising. This is a trick I picked up in one of the books written by a doyen of Cantonese cooking, 江献珠女士 Mdm Pearl Kong Heen Zhu who passed away last year. Those who are interested to learn about the story behind the sauce can read it up in my recipe for 柱侯牛腩焖萝卜 Braised Beef Brisket with Daikon in Chu Hou Sauce where a recipe is also provided for those interested to produce the sauce at home as well. But I prefer to go by the “easy” way, and use storebought chuhou sauce and would always make it a point to bring back a bottle or two whenever I am in Hong Kong. 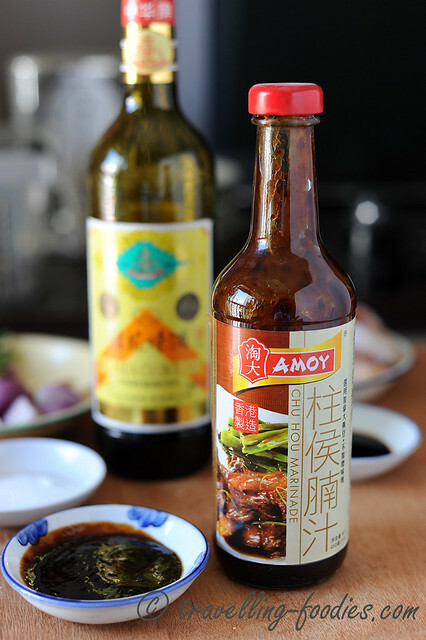 After trying out several available brands, I stick to the one from Amoy. Otherwise, the sauce can also be found in some of our market grocery stalls as well as some condiment suppliers like kwong cheong thye in Singapore. But as brands defer，so would the taste of course. 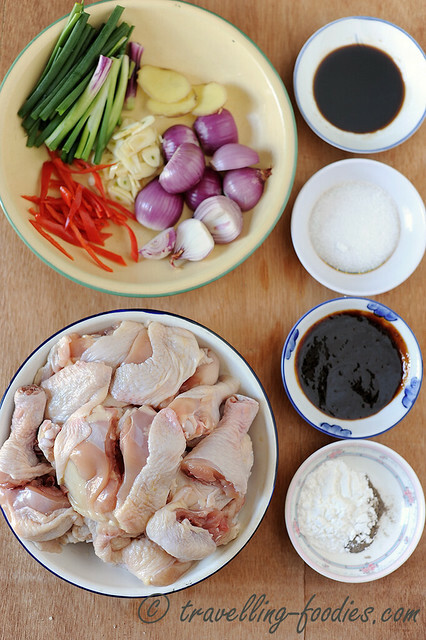 Place chopped chicken, light soya sauce, starch and white pepper in a mixing bowl. Mix well and leave to marinate for 30 min. In a heated wok, pour cooking oil followed by marinated chicken chunks. Pan fry the chicken pieces until the skin is nicely browned. 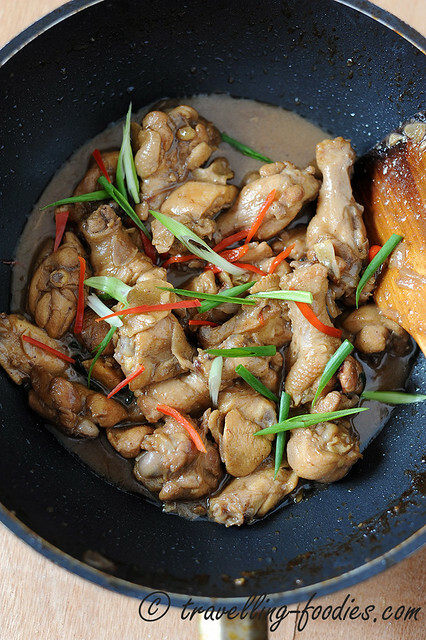 Ladle the chicken chunks into a plate and set aside but leave the rendered chicken fat in the wok. Using the render chicken fat, add bruised shallots and ginger slices. Saute until aromatic and the shallots turns slightly translucent while the ginger becomes slightly dried. Add chu hou sauce and sugar into the wok and stir fry until fragrant. Return chicken chunks into the wok and stir fry to get all the chicken coated with the sauce. Add hot water or chicken stock and stir fry for a while more over medium high flame before covering with lid. Braise the chicken pieces for about 10-15 min or until the sauce is greatly reduced. If more sauce is preferred, more chicken stock can be added prior. A small amount (appro. 1/2 tsp) of dark soya sauce can be added at this point to darken the sauce if necessary. When the dish is ready, drizzle cooking wine around the perimeter of the wok, give everything a quick toss before adding spring onions and chili slices. Dish and plate. Serve with steaming white rice and other dishes. This entry was posted on April 27, 2015 by Alan (travellingfoodies). It was filed under Food, Simple Eats and was tagged with braised chicken, cantonese, chili, chu hou sauce, 粤式, 红椒，桂花陈酒, 绍兴酒, 花雕酒, 葱花, 蒜头, ginger, Hong Kong, huadiao wine, osmanthus wine, scallions, shallots, shaoxing wine, spring onions, 干葱, 柱侯焖鸡, 港式. Looks so delicious ! I discover this sauce ! yeah it is! not sure where you would be able to find it in France though… perhaps in a grocers in a “Chinatown” over there?